Did you know that 1 in every 6 Americans is food insecure and 46.5 million Americans (15%) were reported as living at or below the poverty level in 2012? * To help fight hunger in our local communities, we are thrilled to launch our Fourth Annual Independence from Hunger® Food Drive on July 1st. What is Independence from Hunger®? Independence from Hunger® is a month-long, company-wide campaign where customers can donate food and/or cash to support local food assistance partners. Every Grocery Outlet store is teaming up with an agency in their area and all donations received throughout the campaign will go directly to that partner – staying in the community of that store’s customers. Look for specially-marked food items. These are items that each local food agency has identified as “high-need” items. Purchase these products and then place in the collection bin at the front of the store. Pick up a pre-made bag that is filled with an assortment of the groceries that have been identified as needed – bags are $4.99 or $9.99. Tell your cashier that you’d like to make a cash donation at the register. Donations will go directly to that store’s local food agency partner. Donate $1, $5 or round up your change. Donate on our Facebook page where we will have an online fundraiser to benefit Berkeley Food Pantry. Pick up information at a Grocery Outlet store about hunger, food insecurity and local/national resources for people in need. Be informed and willing to help. 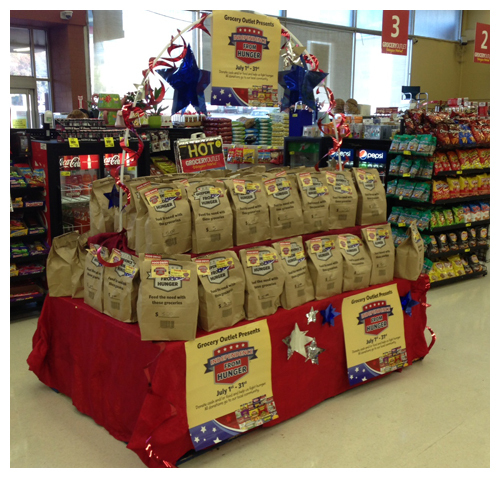 Join the events at your local store to support the Independence from Hunger® food drive. 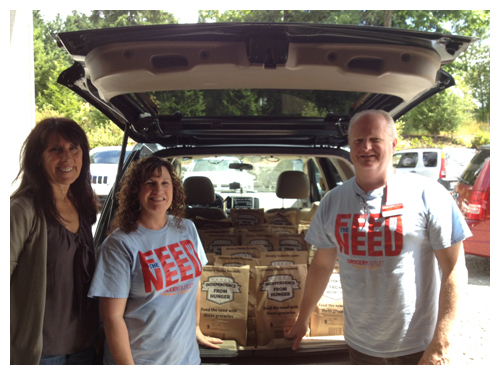 In our first year – July 2011 – we were able to donate more than $223,000 in cash, gift cards and food to help support local food assistance agencies through the generosity of our customers and community partners. In July of 2012, donations increased to over $292,000 —more than half a million dollars donated in just two years! In its 3rd year, the total reached was $300,000. And this year’s goal is to raise enough to put the total donated amount over the $1 million mark. Each of our owner/operators is committed to their community. They have chosen a food assistance agency making a difference within its unique community. We can’t do this without each of you. Stop in to your local Grocery Outlet today and help your community.